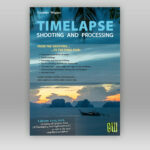 Do you want to know everything about time lapse photography? This e-book is all you will need! After watching my time lapse videos you might have noticed that aside being the developer of LRTimelapse, I am an enthusiastic time lapse photographer and I managed to become fairly skilled in this area during the past few years. I sell Ultra HD (4K) time lapse footage to international broadcast companies, they use them for example to showcase 4K-Televisions or demonstrate other emerging technologies. All those videos are completely made with the techniques described in this e-book. You probably know I always love to share my experiences and thus, I wrote this e-book. Beginning with choosing the correct equipment and the proper camera setup, I explain everything step by step: from shooting, editing single frames, making transitions between individually edited images, and deflickering until rendering out the final video. I explain how to properly deflicker static and moving sequences (i.e. shot from a slider) and I certainly explain how to master the holy grail of time lapse photography. For those of you who don’t know what the holy grail of time lapse photography is, it is the process of creating a smooth transition from day to night or vice versa in a time lapse sequence. This only scratches the surface as to what I will explain throughout this e-book. The e-book concludes with an annex that provides you a summary of the most important workflows, check-lists, and cheat-sheets for you to print out and take with you when you are shooting. I really hope you enjoy the huge effort that I’ve put into this fifth edition and the translation. 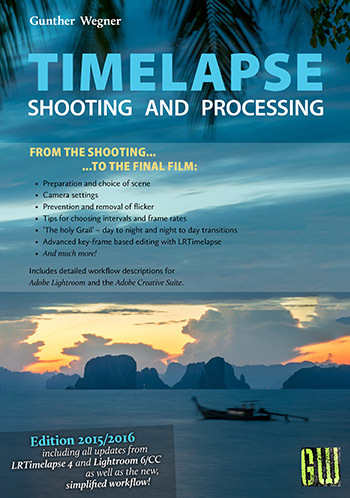 I also hope that it will help you to further develop your capabilities as a time lapse photographer. A German version is included. You find a German description and an excerpt of the German version here. 167 Pages, PDF, English and German. Here is a short excerpt from the book, which includes the complete index, introduction and beginning of the first chapter. Like the products on lrtimelapse.com? Spread the word about them and earn 10% of the purchase price on sales you refer. Click here to learn about the LRTimelapse.com affiliate program!